In the middle of the 19th century the Whigs became uncomfortable with the aristocratic connotations surrounding their political name. Leaders of the Whigs such as Lord Melbourne and Earl Grey began refering to themselves as Liberals, a term used by reforming politicians in Europe. However, the term Liberal was not used officially until 1868 when William Gladstone became Prime Minister. After the passing of the 1867 Reform Act working class males now formed the majority in most borough constituencies. However, employers were still able to use their influence in some constituencies because of the open system of voting. In parliamentary elections people still had to mount a platform and announce their choice of candidate to the officer who then recorded it in the poll book. Employers and local landlords therefore knew how people voted and could punish them if they did not support their preferred candidate. In 1872 William Gladstone decided to remove this intimidation when his government brought in the Ballot Act which introduced a secret system of voting. In the 1874 General Election the Conservative Party won with a majority of forty-six. Benjamin Disraeli became Prime Minister and Gladstone led the opposition Liberal Party. For the next couple of years Gladstone concentrated on writing his book An Inquiry into the Time and Place of Homer in History (1876). However, he was stirred into action when he read about the massacres and tortures inflicted upon the inhabitants of Bulgaria by their Turkish rulers. This resulted in him writing a pamphlet Bulgarian Horrors and the Question of the East (1876). Parliament was dissolved in 1880, and the general election resulted in a overwhelming Liberal victory. William Gladstone now introduced three new measures concerning parliamentary reform. The Corrupt Practices Act specified how much money candidates could spend during election time and banned such activities as the buying of food or drink for voters. The act even stated the number of conveyances that could be used for bringing voters to the polls. In 1884 William Gladstone introduced his proposals that would give working class males the same voting rights as those living in the boroughs. Although the bill was passed in the House of Commons it was rejected by the Conservative dominated House of Lords. Gladstone refused to accept defeat and reintroduced the measure. This time the Conservative members of the Lords agreed to pass Gladstone's proposals in return for the promise that it would be followed by a Redistribution Bill. Gladstone accepted their terms and the 1884 Reform Act was allowed to become law. This measure gave the counties the same franchise as the boroughs - adult male householders and £10 lodgers - and added about six million to the total number who could vote in parliamentary elections. Gladstone and the Liberal Party won the 1886 General Election. William Gladstone now attempted to convince Parliament to accept Irish Home Rule. The proposal split the party and Parliament rejected the measure. Gladstone was defeated in the polls in the 1886 General Election but was once again elected to office in 1892. The following year the Irish Home Rule Bill was passed in the House of Commons but was defeated in the House of Lords. Arthur Balfour replaced his uncle, Marquis of Salisbury, as Prime Minister in 1902. The most important events during his premiership included the 1902 Education Act and the ending of the Boer War. The topic of Tariff Reform split Balfour's government and when he resigned in 1905, Edward VII invited Henry Campbell-Bannerman to form a government. Campbell-Bannerman accepted and in the 1906 General Election that followed the Liberal Party had a landslide victory. Important legislation passed during the first few months of office included the Trades Disputes Act and the Provision of School Meals Act. Henry Campbell-Bannerman became very ill and on 4th April 1908 he was forced to resign and died eighteen days later. Herbert Asquith replaced him as Prime Minister. Asquith appointed David Lloyd George as Chancellor of the Exchequer. Lloyd George now had the opportunity to introduce reforms that he had been campaigning for since he first arrived in the House of Commons. Lloyd George had been a long opponent of the Poor Law in Britain. He was determined to take action that in his words would "lift the shadow of the workhouse from the homes of the poor". He believed the best way of doing this was to guarantee an income to people who were to old to work. Based on the ideas of Tom Paine that first appeared in his book Rights of Man in 1791, Lloyd George's measure, the Old Age Pensions Act, provided between 1s. and 5s. a week to people over seventy. To pay for these pensions David Lloyd George had to raise government revenues by an additional £16 million a year. In 1909 Lloyd George announced what became known as the People's Budget. This included increases in taxation. Whereas people on lower incomes were to pay 9d. in the pound, those on annual incomes of over £3,000 had to pay 1s. 2d. in the pound. Lloyd George also introduced a new supertax of 6d. in the pound for those earning £5000 a year. Other measures included an increase in death duties on the estates of the rich and heavy taxes on profits gained from the ownership and sale of property. 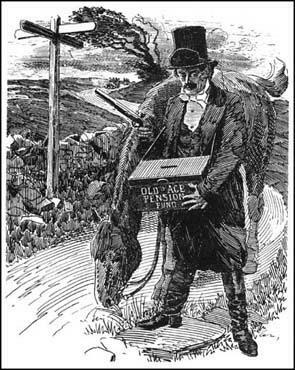 Other innovations in Lloyd George's budget included labour exchanges and a children's allowance on income tax. The Conservatives, who had a large majority in the House of Lords, objected to this attempt to redistribute wealth, and made it clear that they intended to block these proposals. Lloyd George reacted by touring the country making speeches in working-class areas on behalf of the budget and portraying the nobility as men who were using their privileged position to stop the poor from receiving their old age pensions. After a long struggle with the House of Lords Lloyd George finally got his budget through parliament. With the House of Lords extremely unpopular with the British people, the Liberal government decided to take action to reduce its powers. The 1911 Parliament Act drastically cut the powers of the Lords. They were no longer allowed to prevent the passage of 'money bills' and it also restricted their ability to delay other legislation to three sessions of parliament. When the House of Lords attempted to stop this bill's passage, the Prime Minister, Henry Asquith, appealed to George V for help. Asquith, who had just obtained a victory in the 1910 General Election, was in a strong position, and the king agreed that if necessary he would create 250 new Liberal peers to remove the Conservative majority in the Lords. Faced with the prospect of a House of Lords with a permanent Liberal majority, the Conservatives agreed to let the 1911 Parliament Act to become law. Lloyd George's reforms were strongly criticised and some Conservatives accused him of being a socialist. There was no doubt that he had been heavily influenced by Fabian Society pamphlets on social reform that had been written by Beatrice Webb, Sidney Webb and George Bernard Shaw in the early 1900s. However, he had also been influenced by non-socialist writers such Seebohm Rowntree and Charles Booth. Although most Labour Party members of the House of Commons had welcomed Lloyd George's reforms, politicians such as James Keir Hardie, Fred Jowett and George Lansbury argued that the level of benefits were far too low. They also complained that the pensions should be universal and disliked what was later to be called the Means Test aspect of these reforms. In 1912 Hilaire Belloc and G. K. Chesterton of the political weekly, The Eye-Witness, accused David Lloyd George, along with Herbert Samuel and Rufus Isaacs of corruption. It was suggested that the men had profited by buying shares based on knowledge of a government contract granted to the Marconi Company to build a chain of wireless stations. In January 1913 a parliamentary inquiry was held into the claims made by The Eye Witness. It was discovered that Rufus Isaacs had purchased 10,000 £2 shares in Marconi and immediately resold 1,000 of these to Lloyd George. Although the parliamentary inquiry revealled that Lloyd George, Herbert Samuel and Sir Rufus Isaacs had profited directly from the policies of the government, it was decided the men had not been guilty of corruption. Although several leading members of the government favoured granting women the vote, Herbert Asquith still opposed the measure. However, during the 1910 General Election campaign Asquith announced that if he was returned to power he would make sure that women with property would get the franchise. When Asquith changed his mind in November 1911 and instead announced legislation that would enable all adult males to vote, the WSPU organised a window breaking campaign including an attack on Asquith's home. At the end of July, 1914, it became clear to the British government that the country was on the verge of war with Germany. Four senior members of the government, David Lloyd George, Charles Trevelyan, John Burns, and John Morley, were opposed to the country becoming involved in a European war. They informed the Prime Minister, Herbert Asquith, they intended to resign over the issue. When war was declared on 4th August, three of the men, Trevelyan, Burns and Morley, resigned, but Asquith managed to persuade Lloyd George, to change his mind. The progressive wing of the Liberal Party, was disappointed with Lloyd George's unwillingness to oppose Britain's involvement in the First World War. In fact, he soon emerged as one of the main figures in the government willing to escalate the war in an effort to bring a quick victory. After the outbreak of the war, Herbert Asquith made strenuous attempts to achieve political solidarity and in May 1915 formed a coalition government. Gradually the Conservatives in the cabinet began to question Asquith's abilities as a war leader. So also did Lord Northcliffe, the powerful newspaper baron, and his newspapers, The Daly Mail and The Times led the attack on Herbert Asquith. In December, 1916 David Lloyd George agreed to collaborate with the Conservatives in the cabinet to remove Asquith from power. Lloyd George's decision to join the Conservatives in removing Herbert Asquith split the Liberal Party. 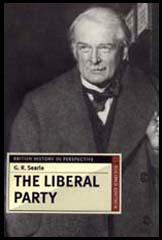 In the 1918 General Election, many Liberals supported candidates who remained loyal to Asquith. Despite this, Lloyd George's Coalition group won 459 seats and had a large majority over the Labour Party and the Liberal Party. Herbert Asquith lost his seat in East Fife in 1918 and William Wedgwood Benn led the groups opposed to Lloyd George's government. John Benn, who was also opposed to Lloyd George, gave the group the name, Wee Frees, after a small group of Free Church of Scotland members who refused to accept the union of their church with the United Presbyterian Church. At the Versailles Peace Conference, the prime minister, David Lloyd George clashed with Georges Clemenceau about how the defeated powers should be treated. Lloyd George told Clemenceau that his proposals were too harsh and would "plunge Germany and the greater part of Europe into Bolshevism." Clemenceau replied that Lloyd George's alternative proposals would lead to Bolshevism in France. At the end of the negotiations Clemenceau managed to restore Alsace-Lorraine to France but some of his other demands were resisted by the other delegates. Clemenceau, like most people in France, thought that Germany had been treated too leniently at Versailles. During the 1918 General Election campaign, David Lloyd George promised comprehensive reforms to deal with education, housing, health and transport. However, he was now a prisoner of the Conservative Party who had no desire to introduce these reforms. Lloyd George endured three years of frustration before he was ousted from power by the Conservative members of his cabinet. (4) In his autobiography, Fate Has Been Kind, Frederick Pethick-Lawrence described meeting Gladstone while studying at Eton College. At the opening of the new Parliament in 1910, with Asquith's Liberals still in power, scenes occurred as stormy as any I have ever seen at Westminster. I refer to the disgraceful behaviour exhibited when the Liberal Prime Minister entered the House for the first time in this new session. "Who killed King Edward? Dirty traitor! Don't bully King George!" was yelled from the Tory benches. (7) On 30th March 1915, Robert Donald wrote an article in the Daily Chronicle claiming that a group of cabinet ministers were conspiring against the prime minister, Herbert Asquith. Lord Riddell recorded how David Lloyd George reacted to the article. He (David Lloyd George) spoke very strongly about the Daily Chronicle article, which he described as indiscreet and foolish. He said that the Prime Minister is much perturbed. "The old boy was in tears," Lloyd George continued. "I shall not let this rest. I have never intrigued for place or office. I have intrigued to carry through my schemes, but that is a different matter. The Prime Minister has been so good to me that I would never be disloyal to him in the smallest detail." I called on Mr. Asquith at 10 Downing Street, at 4 o'clock. He was sitting at the large table in the Cabinet room, his back to the fire. He looked a very lonely figure and a tired man. Lying in front of him were a few letters, just received from a political friends. He had a quiet and severe expression. He said that Mr. Lloyd George had always professed to be the most friendly with him and no rift had occurred in their personal relations. He had the greatest admiration for him. Lloyd George possessed unique gifts, a real flare for politics, foresight, inspiration, etc. He would not say that Lloyd George owed everything to him, but he certainly owed a great deal. He saved him during the Budget of 1909, when all the Cabinet turned against him, and he came to his rescue and risked his own fate with Lloyd George's. But I am also bound to say this - that I believe it is essential in the highest interests, not merely of this country, but of the world, that Britain should at all hazards maintain her place and her prestige amongst the Great Powers of the world. Her potent influence has many a time been in the past, and may yet be in the future, invaluable to the cause of human liberty. It has more than once in the past redeemed Continental nations, who are sometimes too apt to forget that service, from overwhelming disaster and even from national extinction. I would make great sacrifices to preserve peace. I conceive that nothing would justify a disturbance of international good will except questions of the gravest national moment. But if a situation were to be forced upon us in which peace could only be preserved by the surrender of the great and beneficent position Britain has won by centuries of heroism and achievement, by allowing Britain to be treated where her interests were vitally affected as if she were of no account in the Cabinet of nations, then I say emphatically that peace at that price would be a humiliation intolerable for a great country like ours to endure. (12) On the 4th September, 1914, C. P. Scott, recorded details of a meeting he had with David Lloyd George that day. (13) C. P. Scott, editor of the Manchester Guardian, recorded in his diary comments made by David Lloyd George at a private meeting on 27th December, 1917. (14) After the First World War, Lord Northcliffe, who had served in David Lloyd George's cabinet, was highly critical of the prime minister. During the war no one could doubt his patriotism. It was sincere and fearless. But he could not understand comradeship in any enterprise. He only appreciated team work when he was the captain of the team. He resented that co-operation which implied equality and give and take. He had no confidence in any show which he did not run himself. 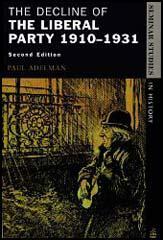 (15) Hilaire Belloc, unpublished memoirs written in 1937. (16) Some people believed that the cartoons of David Lloyd George by David Low in the Daily Star helped to force him out of office in 1922.